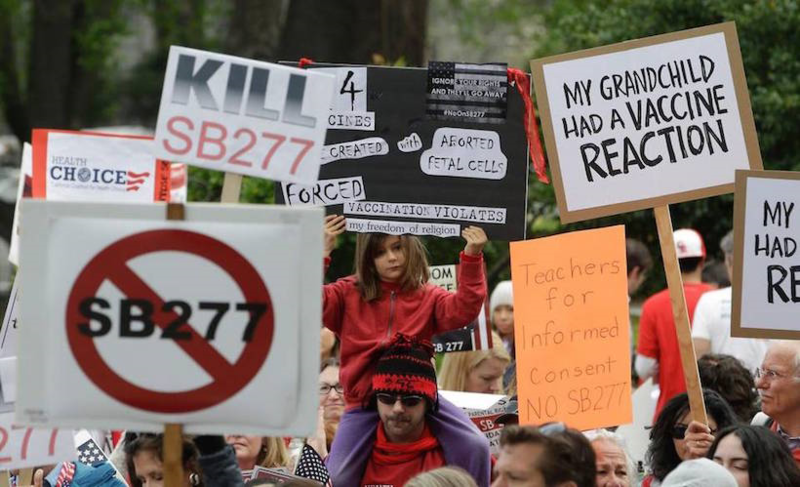 Senate Bill SB277, California’s draconian forced vaccination policy for school children in the public school system, will never see the light of day, if teachers and school administrators go on strike to oppose it. We, the people, (not our Government legislators), ‘have the real power. 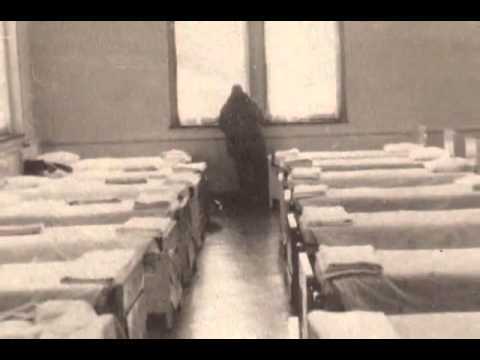 California’s new forced vaccination Bill SB277, for children, represents the most draconian, fascist, unlawful health-directive ever to be forced upon the population in the history of the United States. The whole premise behind personal exemptions was always a ruse. The freedom to choose what goes into your, body, or into your child’s bloodstream, is non-negotiable. The Government has inverted and overturned this basic principle, and has, thus, bound freedom itself, to a contract. 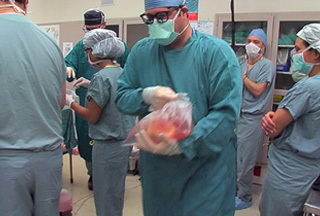 Exemptions from Government imposed health mandates were ultimately designed to fail, by entrapping those members of the community who sign onto them, binding them to an arbitrary (constantly changing) list of choices (demands) that supercede said basic freedoms, and thereupon deny an individual their inalienable, God/life given rights to self-determination of the body. 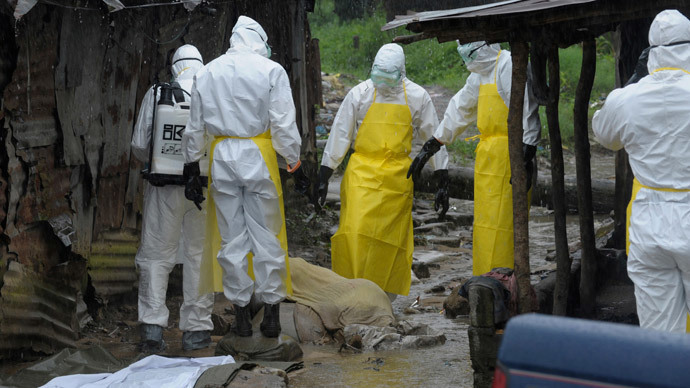 Why has the Ebola virus suddenly erupted in a region of Africa known as the “Meningitis Belt” (comprising all four countries affected – Guinea, Liberia, Nigeria & Sierra Leone)? 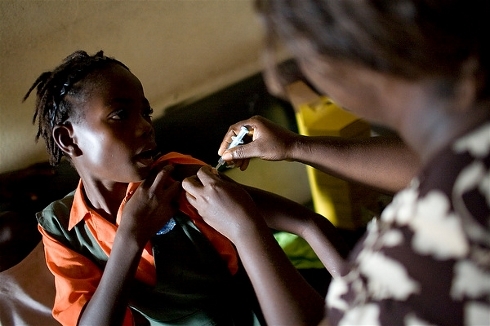 Neighboring Liberia & Sierra Leone, both primary epicenters, were recently subject to the “largest ever Yellow Fever Immunization Program” conducted in that region – an estimated 12 million locals impacted (infected) by the compound shot. 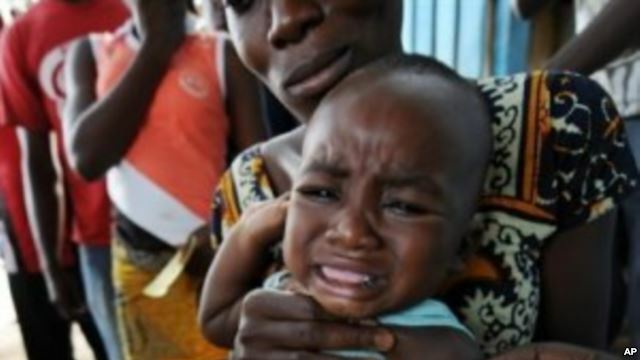 Vaccine Resistance Movement is investigating the link between these extremely toxic experimental vaccines and the sudden surge in cases of Ebola. Symptoms of ‘Acute fulminating Meningococcal Septicemia’, a virulent form of bacterial meningitis (marked by extreme vomiting, hemorrhaging – excessive bleeding around the eyes & mouth, severe blackish bruising on the arms & legs), leading to Septic shock and potentially even death, closely resemble those seen in Ebola victims. This supposed outbreak of Ebola bares all the hallmarks of a rarified, virulent strain of bacterial Meningitis, ‘Acute fulminating Meningococcal Septicemia’, also known as ‘Waterhouse-Friderichsen Syndrome’. Is this yet another case of a dangerous, untested vaccine triggering a tsunami of viral & bacterial mutations – in impoverished regions? Irrespective of whether we are confronting a vaccine-derived hybrid (mutagenic) strain of bacterial Meningitis here, a vaccine-derived hybrid strain of Yellow Fever, or, in fact, a laboratory-derived hybrid strain of the Ebola Virus (essentially a composite of the laboratory produced Aids Virus) the so-called vanguard of Health “Authority”, chiefly the CDC & WHO, are purposefully focusing on a Vaccine & Drug response to this current health crisis, while ignoring the fact that the Ebola Virus can only thrive in a body starved of Selenium – thereby depriving our communities of critical information in a time of national emergency. Selenium is an essential anti-oxidant, the primary stop-gap which enables the human body to adapt to (overcome) any viral infections circulating in the environment, and prevents the typical Ebola-type symptoms (chiefly excessive hemorrhaging) from taking hold and ultimately killing the host (vaccinee). Natural sources rich in Selenium include Brazil nuts, Sunflower seeds & Food Grade Diatomaceo​us Earth (“fossilized shell flour”). 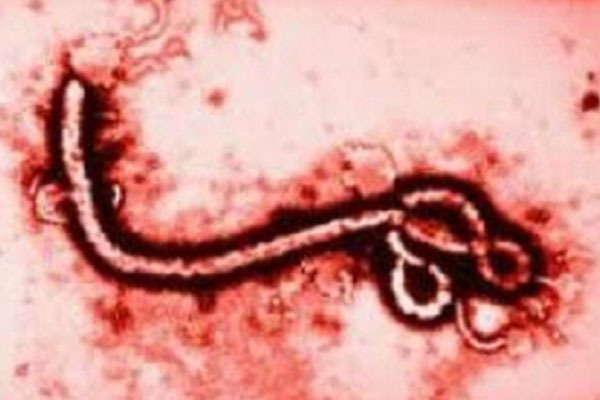 ‘Ebola is classified as a “hemorrhagic fever” virus, and produces the characteristic hemorrhaging due to the formation of blood clots (“disseminated intravascular coagulation”), leading to the obstruction and rupture of small blood capillaries. Once again, just like in 2009, the WHO are purposefully inflating the numbers of victims here, to ensure the maximum fear factor is felt throughout our communities. Until those clinics & hospitals impacted by this crisis release the actual (post mortem) laboratory results, any statistics being foisted on us represent nothing more than speculation at best. 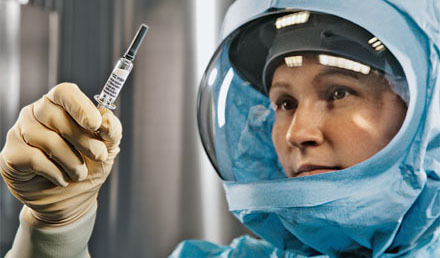 During the 2009 (CDC bio-laboratory produced) Pandemic. 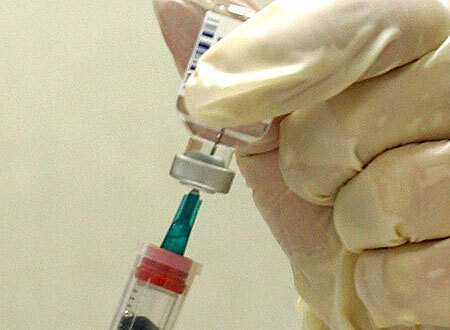 the WHO routinely exaggerated the overall death toll (attributable to H1N1); by including any/all cases associated with Flu-like symptoms – regardless of the fact that the VAST majority of victims inevitably died as a result of compromised immunity and/or pre-existing medical conditions. H1N1 was merely a blip on the radar, by all accounts a comparably mild seasonal flu. 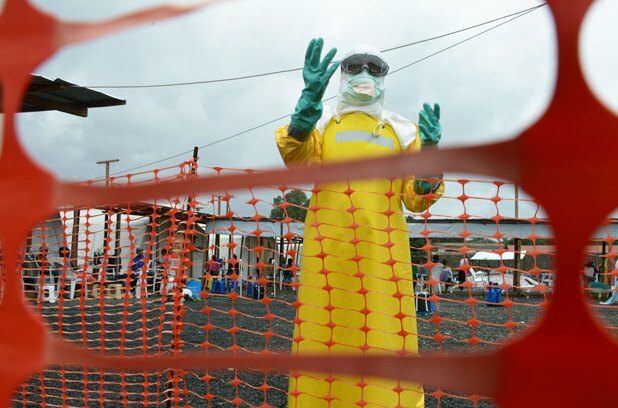 It’s vitally important to analyze the current Ebola scare objectively. 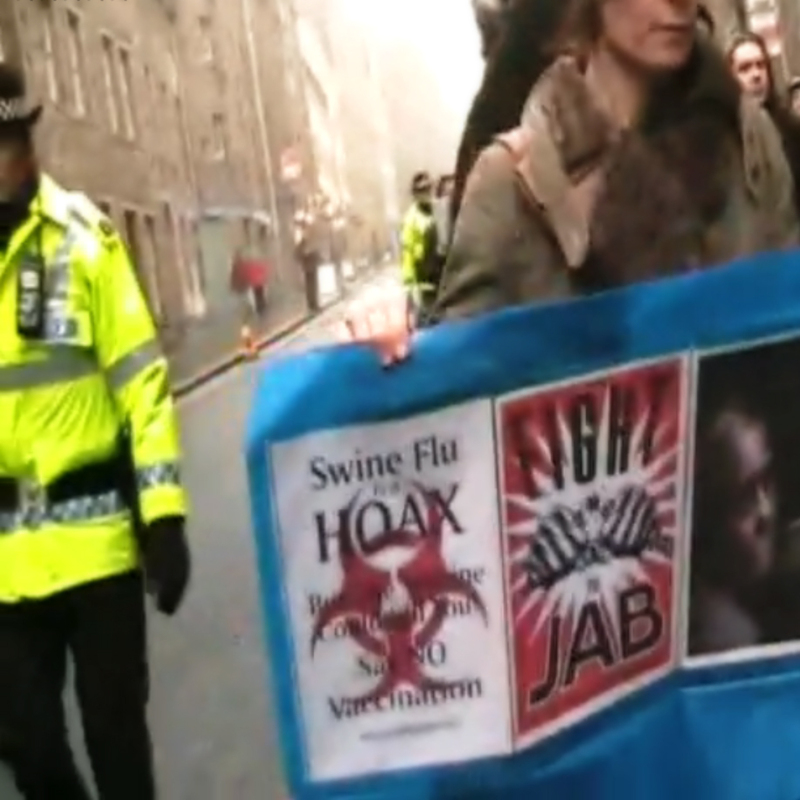 Throughout the recent manufactured “Swine Flu” Pandemic of 2009, communities around the world were manipulated constantly by Mainstream Media outlets (in lock-step with the WHO & spineless Government health departments), via an ongoing barrage of misinformation, negative hype & fear-mongering propaganda. Don’t allow yourself to be drawn into the propaganda. Within a year, this will, once again, be proven to have originated in a CDC Level 4 laboratory. Why are clusters of measles outbreaks on the rise? It has nothing to do with the increasing trend toward lower rates of vaccine uptake throughout our communities; the inference that avoiding getting your child “immunized” with the MMR series increases their risk of susceptibility to measles and transference of measles to other children in their proximity. As Dr Tetyana Obukhanych Ph.D, one of the world’s leading Immunologists (guest speaker at our recent VRM Vaccine Summit) points out, vaccines have stripped mothers, and by extension, their baby, of the capacity for life-long immuno-protection, given the absence of NATURAL childhood exposure to measles in the environment. Parents who received the first wave of measles shots in 1963 (and all those since) were subsequently stripped of their capacity to transfer natural immuno-protection to their baby, via the Placenta & Colostrum, due to the cross-contamination factor (hybrid measles virus now embedded in the mother/father’s germ line DNA – manifesting in a more virulent strain of measles, known as ‘Atypical Measles’ or AMS) generated by the shot, passed on to the new generation. 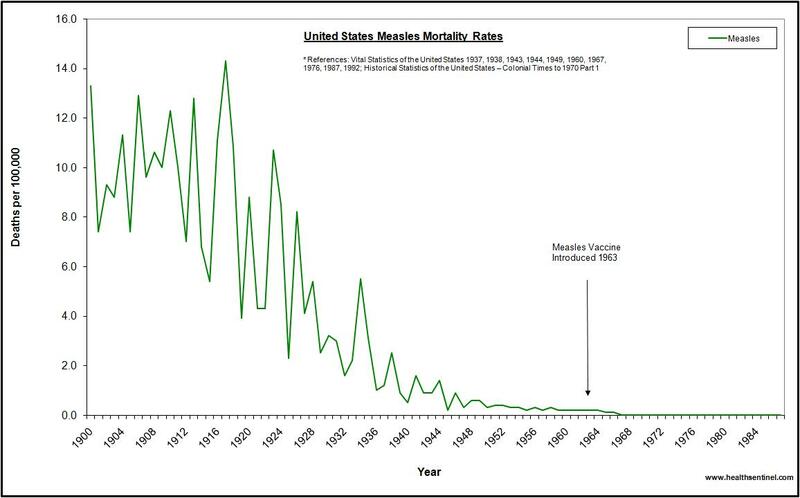 ‘As one of many examples involving all infectious diseases of childhood against which vaccines have been developed, ever since any measles vaccines have been introduced and used in mass proportions, reports of outbreaks and epidemics of measles in even 100% vaccinated populations started filling pages in medical journals. It is less well known to the general public that vaccinated children started developing an especially vicious form of measles, due to the altered host immune response caused by the deleterious effect of the measles vaccines. It resisted all orthodox treatment and carried a high mortality rate. It has become known as atypical measles (AMS). Note: Dr. Andrew Wakefield’s 1998 Study demonstrated “anti-myelin antibodies and digestive tract pathologies in children with autism after being given the Urabi strain triple live virus MMR vaccine. All 12 children in the Study had intestinal abnormalities (known as Inflammatory Bowel Disease), with chronic inflammation in the colon in 11 of the children. Noted behavioral disorders included autism in 9, disintegrative psychosis in 1, and possible post-viral or vaccinal encephalitis (acute brain inflammation) in 2. 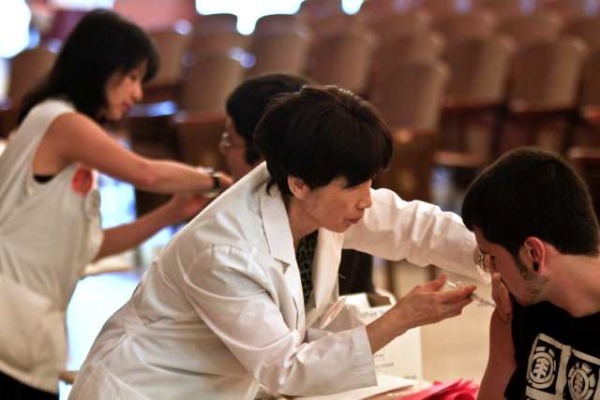 The Urabi strain MMR vaccine purchased by GlaxoSmitheKline for distribution in the UK, a triple live virus version, was directly responsible for an sudden spike in childhood Meningitis in the UK. It had been banned from use in Canada & was warned against further use in Britain by Canadian specialists. This was all suppressed by GSK & The British Gov’t. They are solely to blame for this crisis. ‘The Urabe AM9 vaccine was developed in Japan and was originally attenuated by six passages of a wild isolate in chicken amniotic cavity, after which the virus underwent two plaque purifications in quail fibroblasts. 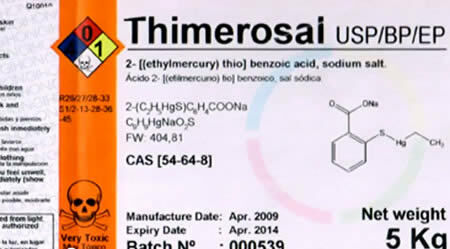 Specifically, the Urabe AM9 component of trivalent measles, mumps and rubella vaccines was associated with meningitis (inflammation of the meninges, the thin, membranous covering of the brain and the spinal cord)and parotitis (inflammation and infection of the salivary glands). First, it would be necessary to demonstrate that the measles virus is indeed present in the lesions, that it is active, and that it contributes to inflammatory responses. Also, it would be necessary to prove that the pathogenic reaction can be induced by the wild virus and by the attenuated viruses present in vaccines. 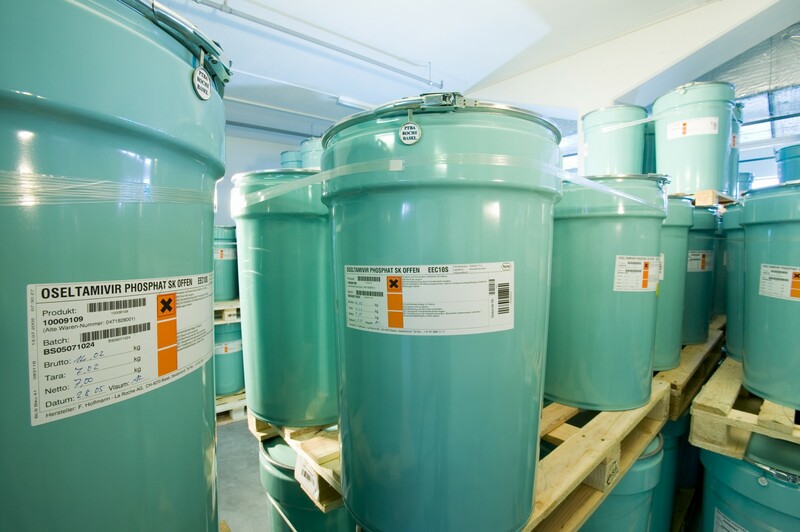 Strains and attenuation procedures vary from one manufacturer to another, and it is far from certain that all strains have the same ability to persist in tissues and to subsequently produce chronic inflammations. As was stated above, measles vaccine does not seem to be associated with SSPE, although the wild virus may be isolated (with difficulty) in patients with SSPE. 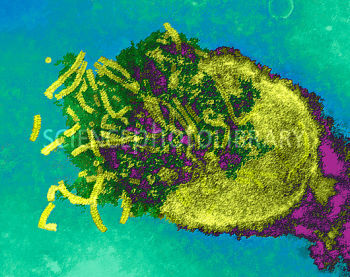 The measles virus was isolated neither in patients with Crohn’s disease or other chronic inflammatory diseases (Paget’s disease, active chronic hepatitis, multiple sclerosis) in which a role for it has been claimed on morphologic, histologic or serologic grounds. ‘If vaccinated children and adults are capable of spreading disease, shall we hold them and their parents legally liable for outbreaks? 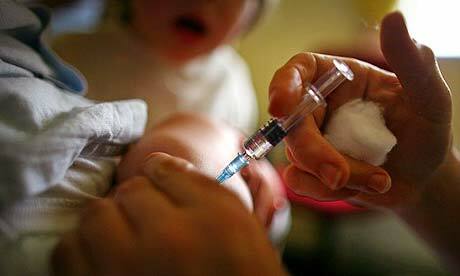 Shall we mandate ‘unvaccination’ as a requirement for public school? 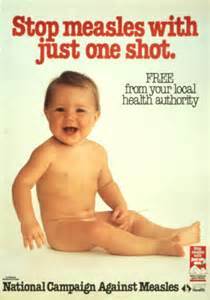 Since we can’t ‘unvaccinate,’ shall vaccinated children be kicked out of public school?‘ Toni Bark, M.D. Research scientists have now identified a direct causal link between subcutaneous &/or intramuscular injection of the Hepatitis B Vaccine and resulting Mitochondrial dysfunction (hallmark symptom of Autism); including premature apoptosis or “programmed” type cell death. Hep B vaccine factors into eventuality of Early Onset Autism, since it represents the earliest premature breach of a baby’s delicate, under-developed “electrical grid system” (Myelin sheath, Meninges & Blood Brain Barrier). WILLOWBROOK STATE SCHOOL FOR MENTALLY CHALLENGED (Staten Island, NY )/196O’s – Mentally challenged students (inmates) were forcibly injected with cancerous Hepatitis B shots. Thousands infected, hundreds died. ‘Dr. Saul Krugman of New York University conducted studies of hepatitis during the 1950s and 1960s on the severely mentally retarded. He systematically infected newly arrived children between the ages of three and eleven with strains of the virus obtained from the feces of Willowbrook hepatitis patients. 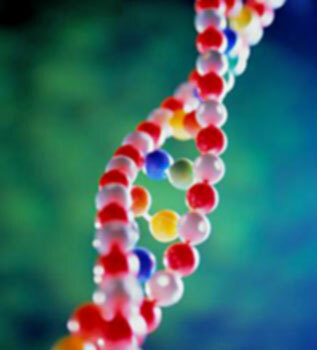 This was done to study the natural history, effects, and progression of the disease. Franz Inglefinger, who later became the editor of the New England Journal of Medicine said, “By being allowed to participate in a carefully supervised study and by receiving the most expert attention available for a disease of basically unknown nature, the patients themselves benefited. 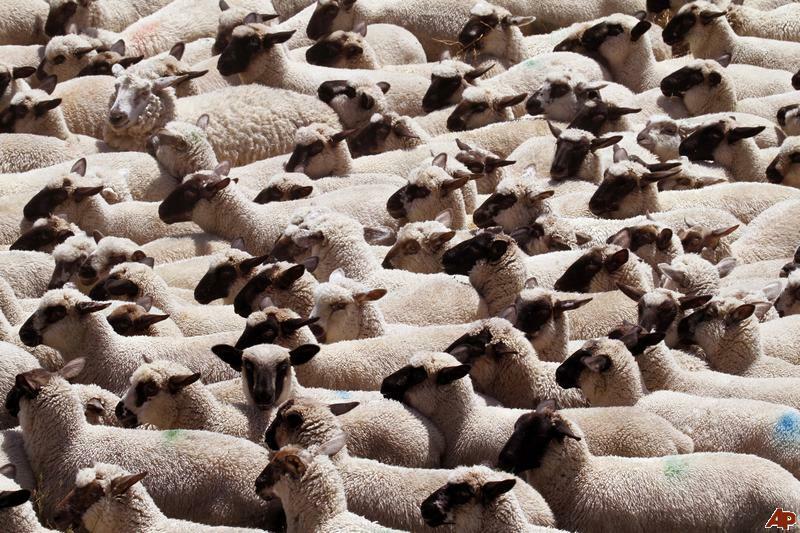 Once again this year, Government “Health Officials” & Mainstream Media outlets are in unison, using the same desperate tactics they employed during 2009, the marketing ploy of “artificial scarcity”, withholding vaccine supplies long enough to create the PERCEPTION of a shortage, while reinforcing the myth of herd immunity compliance locally; banner headlines of crowds “flocking” to emptied-out clinics, panic everywhere, all in a desperate attempt to frighten the public into getting the Flu shot. 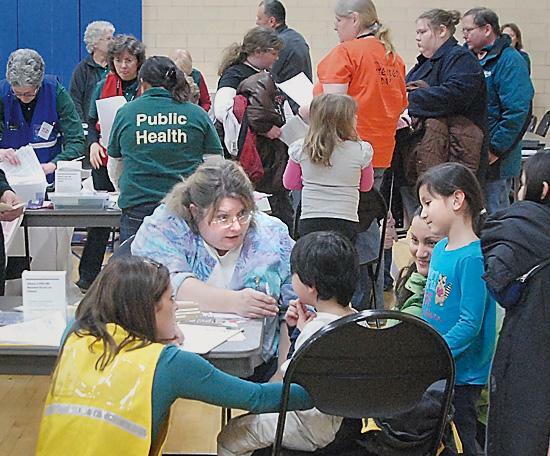 Just remember, 65-70% of our community are REFUSING to get the Flu shot every year. Statistically, 70% of Canadians are REFUSING to get the Flu shot every year…only 30% of Canadians in compliance (based on Statistics Canada: Annual rates): 25-28% of males get the flu shot, while 30-33% of females get the flu shot. The Flu itself cannot kill you; rather the result of acute bacterial pneumonia triggered BY Flu-like symptoms. Most victims of the Flu are those 65 years and older. In almost every instance a compromised immune system and/or a pre-existing medical condition is the key determinant factor in those unfortunate victims (at whichever age) who die from the Flu. 4. Most children who succumb to seasonal Flu, either via death or serious long-term illness (in particular those tracked since 2009), are subsequently found to have been 8 times more predisposed to a Methicillin-resistant Staphylococcus Aureus (MRSA) bacterial co-infection occurring in the lungs. A growing number of children with Autism are now potentially cross-infected with SV40 (diseased African Green Monkey kidney derived Polio virus) type hybrid strains of Poliomavirus (67% infection with Simian Virus); based on a recent Controlled Study which found poliomavirus infection in postmortem brains of sufferers of Autism – inevitably the result of inter-generational cross-contamination from Salk & Sabin Polio inoculations, sugar cube/oral drops versions & the subsequent Inactivated Polio Vaccine now on the schedule; fixed in the germline DNA of babies/children. Please consider supporting the ongoing efforts of VRM in awakening our communities to Vaccine Industry malfeasance & the paradigm shift toward self-sufficiency & holistic health. This important gathering marked the first big push forward following our recent VRM Vaccine Summit. 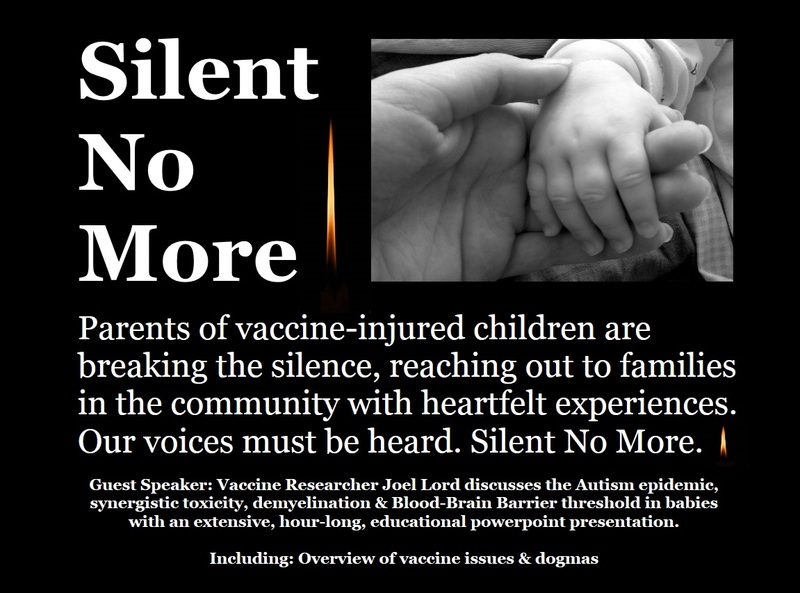 The VRM Silent No More Project brings together some of the same parents of vaccine-injured children in a more intimate setting. Vaccine Researcher Joel Lord also conducts an extensive presentation on the Autism epidemic, synergistic toxicity, demyelination & blood-brain barrier threshold in babies, with a detailed Powerpoint presentation. 2 disks and over 4 hours of ground-breaking footage. Anyone in the community able to donate $25 or more to VRM will be honoured with a personal, signed copy of the upcoming ‘VRM: Silent No More Project’ DVD – while supplies last. Ongoing availability of this release to a wider community is contingent on us reaching a minimal goal of financing. So I am reaching out to you now. For those able to donate $50 or more, I will send you a signed copy of the bound booklet version The VRM Autism Report or The Problem With Vaccines Part 4 – Primary Aspects of Vaccine Toxicity Affecting The Body, both of which have been expanded for this special edition (while supplies last); in addition to a signed copy of the VRM Silent No More Project DVD. For donations of $100 or more I will send you a signed copy of the bound booklet version The VRM Autism Report plus The Problem With Vaccines Part 4 – Primary Aspects of Vaccine Toxicity Affecting The Body, both of which have been expanded for this special edition (while supplies last); in addition to a set of signed copies of the VRM Silent No More Project DVD. A great inspiration of mine has just passed away. Dr. Andrew Moulden, an extraordinary font of knowledge who challenged the entire basis of vaccination using the science of the body, a true pioneer in the field of vaccine research, who broke through all the Industry lies & rhetoric by identifying the root cause in ALL cases of vaccination-induced neurological & neurodevelopmental trauma…Ischemia. If it weren’t for Dr. Andrew Moulden’s extraordinary research, I would never have found my way to the heart of the matter as a vaccine researcher. The brain and nervous system is wired in a very specific format. Functions are localized to specific areas. 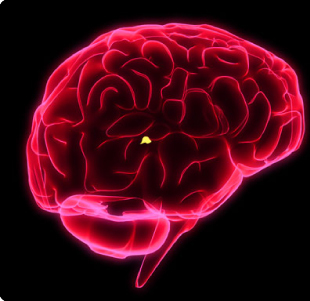 Having studied brain and behavior, neurosciences, clinical neuropsychology, child neurodevelopment, functional brain imaging, clinical neurology, clinical neuropsychiatry, clinical medicine, immunology, hematology, tests and measurement, and understanding the tools and assumptions and techniques of mainstream medicine, I fell in the unique position of having being able to see clinical medicine problems, from a multitude of simultaneous areas of expertise and scientific knowledge. Relative to the human brain, I understood “rules and laws”Â of brain function relative to brain damage and the mechanisms of medical physiology that can uniquely cause unique patterns of brain damage in ways that my clinical skills could detect, that mainstream neuroimaging cannot. The initial “aha”Â moment was in 2001. I was seeing, autistic patients, coming out of medical school – they had a trans-cortical motor aphasia, isolation of speech syndrome, and very specific cranial nerve palsies that could ONLY be accounted for by ischemic stroke. Remarkably, my studies of schizophrenia, dementia, and research exposure to neuroimaging modalities and brain and behavioral assessments before medical school contributed to my ability to “see”Â what has been in front of our eyes all along – ischemic strokes and brain damages – from vaccinations. The problem has been we neither knew how to measure, when to measure or what to measure, let alone what the limitations were, of the tools we have been using to measure brain integrity, in health, disease and disorder. It has taken the past several years to decipher how ischemic brain damages were happening in the autism we were seeing and the many other neurodevelopmental disorders. I now believe I have the answers for this, or so it appears and some solutions. Here’s one of those rare moments captured when a brilliant mind, unfettered by mainstream academic dogma, soars on the wings of truth. Andrew, may you rest in peace. The only purpose for modern hospitals should be that of promoting the betterment of life (including that of life-saving triage surgery). Instead, most current hospitals are designed primarily to further the massive profits of Institutionalized long-term “chronic” care & Western Allopathic ‘”symptom-based” Medicine. Hyperbaric Oxygen Therapy (HBOT) rapidly eradicates cancer cell growth & quickly restores cell vitality to effected areas in the body without the toxic side-effects associated with Conventional Western Allopathic methods (ie. 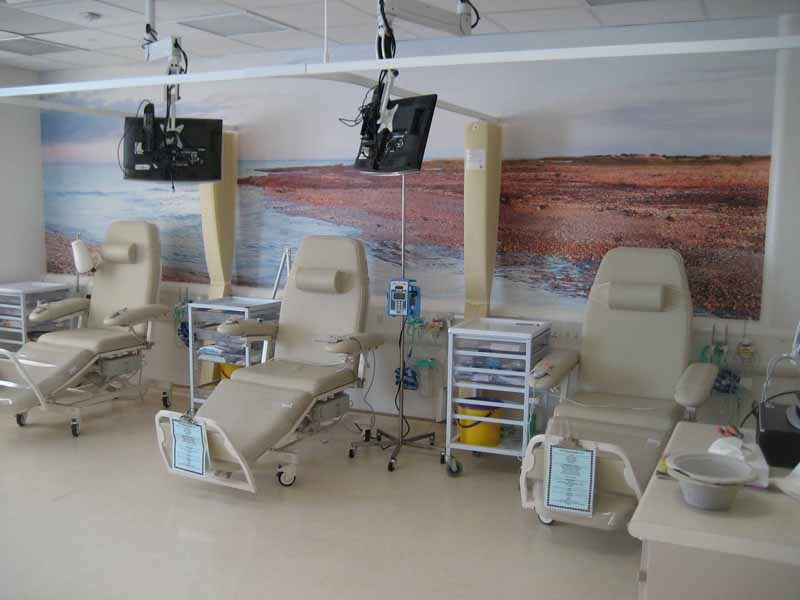 Chemotherapy); however it is not being applied readily or effectively where it is needed most. ‘Some, but not very many, hospitals have a hyperbaric chamber. Smaller units may be available in outpatient center.‘ This despite the fact that it can be made cost effective for patients, with promising results currently demonstrated in Britain. On average, 70% of Canadians are REFUSING to get the Flu shot every year…only 30% of Canadians in compliance (based on Statistics Canada: Annual rates) 25-28% of males get the flu shot, while 30-33% of females get the flu shot. Bravo! Typically, 50-70% of nurses & doctors (front-line workers) refuse the flu shot. In Canada, this trend was noted long before 2009. ‘Only 43 per cent of acute care staff and 68 per cent of residential care staff on average had the flu shot from 2005 to 2009, according to Vancouver Coastal Health.‘ The remainder, approximately 20.4 million doses ($150,000,000+) were incinerated, a total of $200,000,000+ worth of unused H1N1 vaccine (50% of total investment). 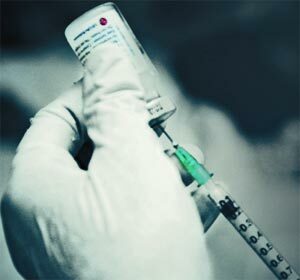 Canada ordered 50.4 million doses of H1N1 vaccine during the Pandemic in 2009, costing the taxpayers $400,000,000+. According to Health Canada, 45% of Canadians received the shot (on average). 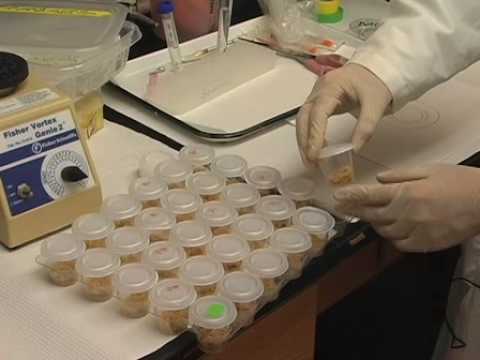 5 million doses were donated to the WHO (to be sent to Africa, Asia & Eastern Europe). Another 5 million doses were “loaned out” to Mexico. 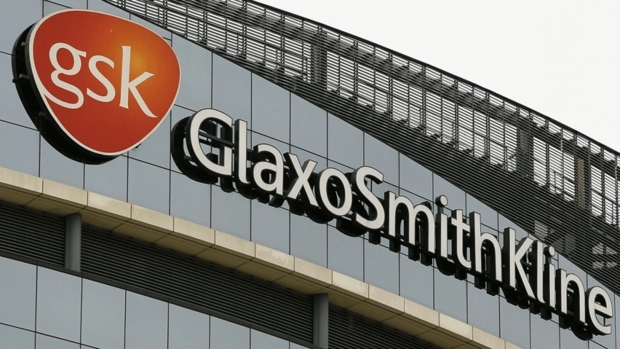 The Canadian federal gov’t has since announced a new 10-year pandemic flu vaccine contract with GlaxoSmithKline, valued at more than $425-million (in addition to a 3 yr $33-million contract to Sanofi Pasteur Ltd & a $50-million contact to Novartis, a total investment of $500 million+). The contract is intended to ensure a secure supply of vaccine for Canadians in the event of “a future influenza pandemic”. 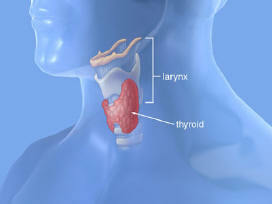 The Thyroid Gland is critical in the body. The extent of its ability to function normally determines your degree of overall heath. It is a bell weather indicator. A compromised immune system is much more vulnerable to infection & seasonal influenza. Vaccines target/undermine the Immune system by introducing live viruses & toxic heavy metals to an already overloaded network; systematically stripping the body of its capacity to harness vital trace minerals (chiefly Selenium, Zinc, Magnesium) & antioxidants (chiefly Vitamins A, B6/B12, C, D3, E + Glutathione). 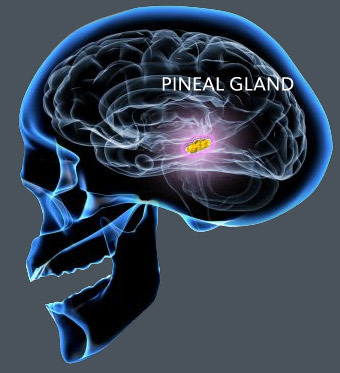 The synergy of immunological, neurological & physiological well being hangs in the balance. Thus the delicacy of our glands must be protected. Otherwise a domino effect of sickness & long term deterioration of health are inevitable. The cream of the crop in the Medical community are immediately sought after in Medical School by Vaccine Manufacturing giants long before they graduate, with the eventual promise of scientific research grants, lucrative payoffs & promotions for product endorsements at medical seminars, through the commissioning of fraudulent clinical trials, including the luxury of all expenses paid weekend getaways, and other incentives once they graduate to top positions in major hospitals & clinics (such as unlimited access to free samples & donated medical equipment). In return, these obliging doctors must tow the line and push these Vaccines on our communities, without reservation. For some, whose values were compromised early enough, the original meaning of the Hippocratic Oath, “Thou Shalt Do No Harm” has long since lost to the lustre, the lure and the prestige afforded by the almighty dollar. Their education is specifically limited & tailored to the scope of that which supports the advancing of the Industry food-chain of profits, under the banner of “herd immunity”. 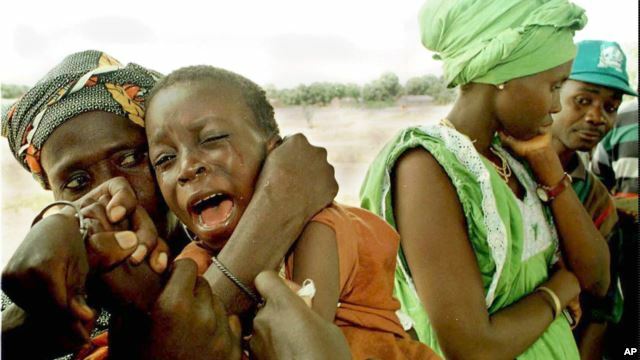 The human cost is typically overlooked and under-reported. This wide gulf in understanding can be explained. 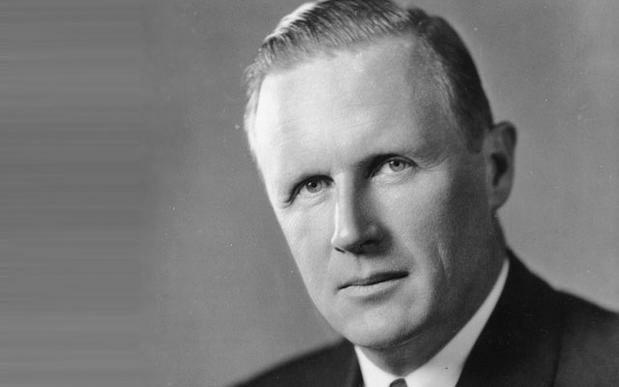 George W. Merck, grandson of Heinrich Emanuel Merck (founder of the German-based drug-manufacturing firm ‘E. Merck AG’), took over the US branch of the pharmaceutical firm, known as ‘Merck & Co.’, in 1925. According to officially “withdrawn” documents (see Keesing’s Contemporary Archives, London, February 2-9, 1946), George W. Merck was appointed ‘Official chairman of the Biological Warfare Committee of the US Army Chemical Warfare Service’, during WW2. In 1942 he was authorized, by President Roosevelt, to study & manufacture biological weaponry for the US Military. ‘The idea of biological weaponry was controversial, since little was known about the predictability or effectiveness of biological weapons in wartime. President Roosevelt approved the plan in 1942, and the War Reserve Service, headed by George W. Merck, was established and attached to the Federal Security Agency, a New Deal agency of the Department of Agriculture. The War Reserve Service started out in mid 1942 with a budget of $200,000. Secret work began under Merck’s direction at 28 American universities, including Harvard, Stanford, and other top schools. This agency received consultative advice from national scientific committees and organizations, including the National Academy of Sciences and the National Research Council. 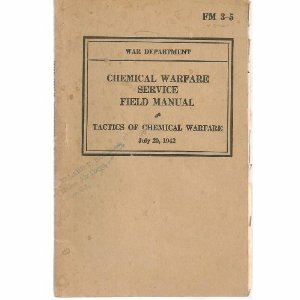 The War Reserve Service also empowered the U.S. Army’s Chemical Warfare Service to greatly expand its efforts in regard to biological weapons. 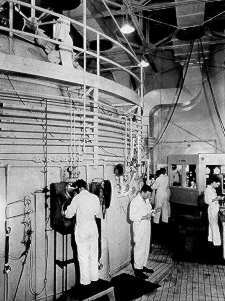 The army’s efforts were better funded than those of the War Reserve Service: in 1942 and 1943, the Chemical Warfare Service received millions of dollars to build research facilities. Several locations were selected for the army’s biological research, with the main headquarters at Camp Detrick, Frederick, Maryland, a small National Guard airfield (designated Fort Detrick in 1956). 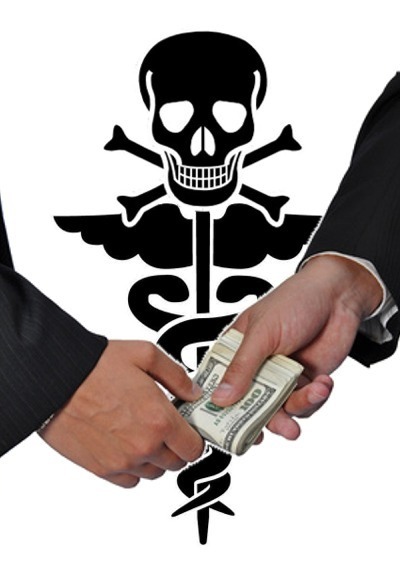 The modern healthcare system, like any powerful corporation, is designed to favor those who acquiesce with their rules & regulations; likewise to weed out & alienate those who do not fall into line with the rest of the “herd”. The entire cesspool of Western Allopathic Medicine, fueled by a medical mafia monopoly, dominates our lives through an endless barrage of mainstream media propaganda, a giant social engineering model, run by select commitees of overpaid Technocratic Elites – void of any decent moral code of ethics, adherence to the Hippocratic oath or underlying sense of altruism toward humanity. How do we avoid their calibrated landmines, and retain what little we can of self reliance and self-sustaining capacity for natural immunity in these tyrannical times? We must reluctantly go along with their manufactured guidelines, in order to stand clear from the rest of the herd. It is important to understand that ANY/ALL exemptions pertaining to standard immunization vaccines (medical, religious or moral/personal belief type) are fundamentally illegal, because they tranpose an inherent human RIGHT into a PRIVILEGE, on the presumption that you acknowledge and thus sacrifice your natural born “freedom of choice” to an external authority. This is the basis of the looming collectivist (authoritarian) model being rolled out worldwide – the complete isolation of non-conformists and critical thinking individuals. Just remember, it is all color of law, technically a form of entrapment. Eventually they will tighten the noose, and cut everyone off from independent options altogether. 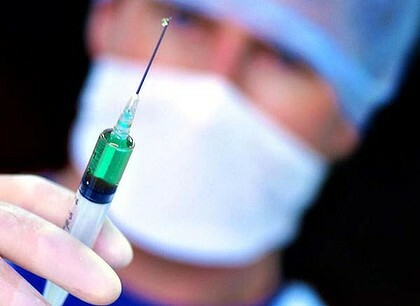 In order to attain an education, in order to maintain a job, in order to enter a hospital or clinic, in order to go shopping, in order to travel, in order to live amongst others (including your family) within any community, ultimately in order to function on any practical level within society, you will be FORCED to get your shots. Dr. Boyd Hayley performed a synergy experiment using aluminum hydroxide, mercury & neomycin (antibiotic associated with Kidney Failure, hazardous to a fetus). The results indicated a 75% acceleration in cell deaths when all 3 ingredients were combined. The transition to self-sufficiency, in terms of restoring optimal natural health in the body, requires a genuine paradigm shift in consciousness AWAY from dependency on outside forces, by reclaiming the inherent instinct for survival and unregulated communal living; where-in we can relearn the wisdom & knowledge of natural cures (via tinctures, broths, ointments, spices, essential oils, phytonutrient & antioxidant derived holistic remedies) which our ancestors coveted and passed on from generation to generation within the community. I find it ironic that my work on vaccines receives the most criticism & scepticism from those mainstream medical professionals (fresh out of Medical school) working on the front lines. The vast majority of parents I encounter, however, particularly those with children suffering from neurological & neurodevelopmental difficulties, are able to grasp the evidence I lay out before them without prejudice; avoiding the trap common amongst those trained in the halls of Western Allopathic Medicine, that of consciously obstructing one’s capacity for critical thinking, when the truth flies in the face of everything you were taught to believe, everything you have invested in. In the aftermath of the devastating tragedy in Newtown, Connecticut, this is clearly a time for heart-felt grieving and close family reflection. However, it is still CRITICALLY important to note that the shooter, Adam Lanza, was diagnozed with Asperger Syndrome, a higher functioning form of Autism, which manifests in delayed social & motor skills, plus extreme sensitivity to sensory stimuli (a commonality of symptoms with those children coping with severe forms of Autism ie. identical dietary deficiencies). The Mayo Clinic routinely recommends the use of anti-depressants & anti-psychotic drugs (Selective Serotonin Re-uptake Inhibitors) for Autism related “symptom management”. It will undoubtedly surface in the coming days & weeks, that Adam Lanza had been prescribed “Antipsychotic medication” such as thioridazine (Mellaril), haloperidol (Haldol), chlorpromazine (Thorazine), clozapine (Clozaril), sertindole (Serlect), olanzapine (Zyprexa), or risperidone (Risperdal), and/or in combination with anti-depressants (Paxil, Prozac, Luvox, Seroxat, Celexa, Lexapro, Cipralex, Zoloft, Lustral, Dilantin, Coumadin) – all of which are ADMITTED to cause psychotic breaks and suicidal-type tendancies in those suggestible/susceptible to inwardly-outwardly destructive thought patterns, particularly in children/teens already close to the edge. There are some issues which supercede job security. This is one of them. It’s time for Health Care Workers everywhere to stand up for their basic rights to self-determination of the body, with a blanket refusal of all draconian workplace vaccine mandates. If that means losing your current job in the bargain, then it is a short term sacrifice worth making. There will always be viable employment opportunities available throughout the alternate sector of clinics, hospitals & private practices. 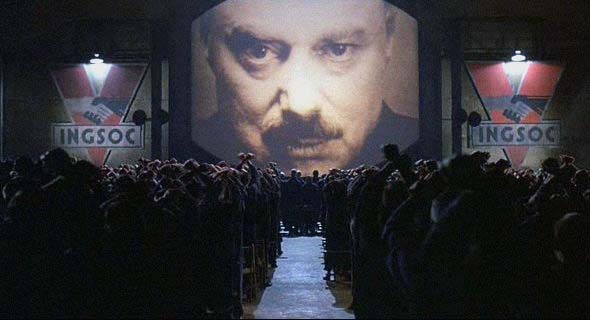 Once you give in to increasingly stringent authoritarian measures, you risk not only your immediate & longterm health, but, in doing so, will thus have abdicated your inherent freedom to choose as an individual, and sacrificed your professional integrity to a misguided & scientifically invalid policy directive. A growing number of families throughout our community have reached the same conclusion: The Flu Vaccine is a complete, abject fraud & failure. Stand firm in your belief, as many others have. You are all truly an inspiration to your colleagues! 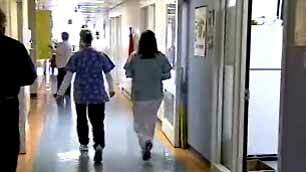 Cincinnati ‘Health system TriHealth’, a centralized health care system controller which operates Good Samaritan & Bethesda North hospitals, Hospice of Cincinnati, Queen City Physicians & Group Health Associates doctors groups, is set to fire 150 front line Health Care Worker “employees” on Wednesday, November 29th. 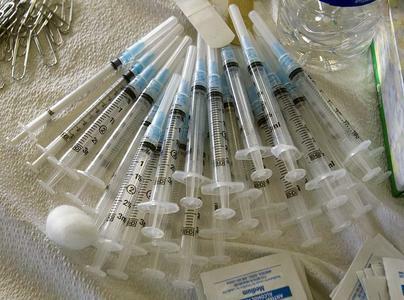 All received termination notices the day before Thanksgiving, for failing to comply with a mandatory Flu shot regulation. ‘Health system TriHealth had a message for 150 employees Wednesday: We really mean it this time. The 150 workers who didn’t get the required flu shots by the Nov. 16 deadline received termination notices the day before Thanksgiving. 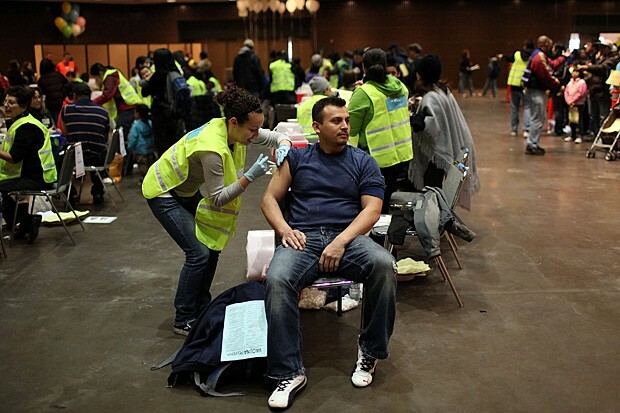 To keep their jobs, they need a flu shot by Dec. 3 (2012). “The flu vaccine still is the best way to protect our employees and our patients against the flu,” spokesman Joe Kelley said. Eight Indiana front-line nurses, most of them veterans with decades of experience, have been fired outright for refusing to take the Flu shot. Religious exemption waivers were overlooked. ‘An Indiana hospital has fired eight employees, many of them veteran nurses, because they refused to take the flu vaccine. IU Health Goshen is just the latest hospital to force its employees to receive the jab and fire or discipline the ones who object. At least four of the nurses who was terminated tried to appeal the vaccine on religious grounds with the help of a lawyer. The hospital rejected their arguments and fired them anyway. Roche Pharmaceuticals, manufacturer of Tamiflu (oseltamivir phosphate) – marketed as ‘a prescription drug…an oral antiviral treatment (not a vaccine!) 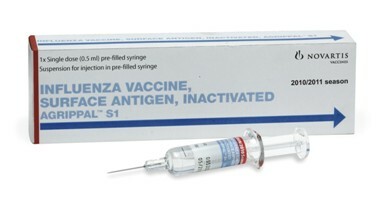 for influenza, belong(ing) to a class of medicines called neuraminidase inhibitors (NAI) ostensibly designed to be active against all clinically relevant influenza virus strains…proven to be effective in the treatment and for the prevention of influenza in adults and in children 1 year and older’, are currently facing intense scrutiny in Medical circles, for deliberately withholding primary Clinical Trial data on Tamiflu. Under pressure from a UK Government led commission investigating the safety & efficacy of neuraminidase inhibitors, the British Medical Journal (BMJ), backed by the Cochrane Collaboration (a non-profit international organization comprised of the world’s leading Medical researchers & practitioners) have jointly accused Roche of deliberately withholding the majority of “full study reports” pertaining to the anti-viral drug Tamiflu, including suppressing potentially damning evidence of adverse side effects. ‘8 of the 10 RCT’s (randomized controlled trials), on which effectivcness claims (of Tamiflu) were based, were never published, and the only 2 that had been published were funded by Roche and authored by Roche employees and Roche-paid external experts…The Cochrane reviewers now know that there are at least 123 trials of Tamilfu and that the majority (60%) of patient data from Roche Phase 3 completed treatment trials remains unpublished. There are concerns on a number of fronts: the likely overstating of effectiveness and the apparent under-reporting of potentially serious adverse effects. DESCRIPTION: TAMIFLU (oseltamivir phosphate) is available as capsules containing 30 mg, 45 mg, or 75 mg oseltamivir for oral use, in the form of oseltamivir phosphate, and as a powder for oral suspension, which when constituted with water as directed contains 12 mg/mL oseltamivir base. In addition to the active ingredient, each capsule contains pregelatinized starch, talc, povidone K 30, croscarmellose sodium, and sodium stearyl fumarate. The 30 mg capsule shell contains gelatin, titanium dioxide, yellow iron oxide, and red iron oxide. 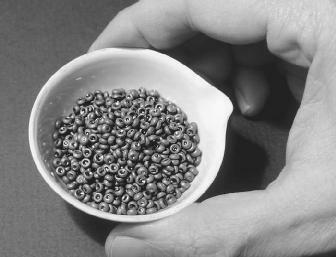 The 45 mg capsule shell contains gelatin, titanium dioxide, and black iron oxide. The 75 mg capsule shell contains gelatin, titanium dioxide, yellow iron oxide, black iron oxide, and red iron oxide. Each capsule is printed with blue ink, which includes FD&C Blue No. 2 as the colorant. In addition to the active ingredient, the powder for oral suspension contains sorbitol, monosodium citrate, xanthan gum, titanium dioxide, tutti-frutti flavoring, sodium benzoate, and saccharin sodium. Oseltamivir phosphate is a white crystalline solid with the chemical name (3R,4R,5S)-4-acetylamino- 5-amino-3(1-ethylpropoxy)-1-cyclohexene-1-carboxylic acid, ethyl ester, phosphate (1:1). The chemical formula is C16H28N2O4 (free base). In clinical studies in the treatment of naturally acquired infection with influenza virus, 1.3% (4/301) of posttreatment isolates in adult patients and adolescents, and 8.6% (9/105) in pediatric patients aged 1 to 12 years showed emergence of influenza variants with decreased neuraminidase susceptibility in cell culture to oseltamivir carboxylate. Substitutions in influenza A neuraminidase resulting in decreased susceptibility were H274Y in neuraminidase N1 and E119V and R292K in neuraminidase N2. In clinical studies of postexposure and seasonal prophylaxis, determination of resistance by population nucleotide sequence analysis was limited by the low overall incidence rate of influenza infection and prophylactic effect of TAMIFLU. Disclaimer: ‘People with the flu, particularly children and adolescents, may be at an increased risk of seizures, confusion, or abnormal behavior early during their illness. These events may occur shortly after beginning TAMIFLU or may occur when flu is not treated. These events are uncommon but may result in accidental injury to the patient. Therefore, patients should be observed for signs of unusual behavior and a healthcare professional should be contacted immediately if the patient shows any signs of unusual behavior. ‘Observed During Clinical Practice: The following adverse reactions have been identified during postmarketing use of TAMIFLU. Because these reactions are reported voluntarily from a population of uncertain size, it is not possible to reliably estimate their frequency or establish a causal relationship to TAMIFLU exposure. In a 2-week study in unweaned rats, administration of a single dose of 1000 mg/kg oseltamivir phosphate to 7-day-old rats resulted in deaths associated with unusually high exposure to the prodrug. However, at 2000 mg/kg, there were no deaths or other significant effects in 14-day-old unweaned rats. Further follow-up investigations of the unexpected deaths of 7-day-old rats at 1000 mg/kg revealed that the concentrations of the prodrug in the brains were approximately 1500-fold those of the brains of adult rats administered the same oral dose of 1000 mg/kg, and those of the active metabolite were approximately 3-fold higher. Plasma levels of the prodrug were 10-fold higher in 7-day-old rats as compared with adult rats. These observations suggest that the levels of oseltamivir in the brains of rats decrease with increasing age and most likely reflect the maturation stage of the blood-brain barrier. No adverse effects occurred at 500 mg/kg/day administered to 7- to 21-day-old rats. At this dosage, the exposure to prodrug was approximately 800-fold the exposure expected in a 1-year-old child. The concurrent use of TAMIFLU with live attenuated influenza vaccine (LAIV) intranasal has not been evaluated. 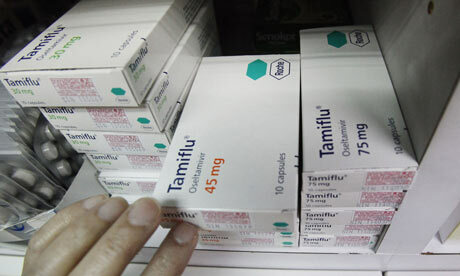 However, because of the potential for interference between these products, LAIV should not be administered within 2 weeks before or 48 hours after administration of TAMIFLU, unless medically indicated. The concern about possible interference arises from the potential for antiviral drugs to inhibit replication of live vaccine virus. 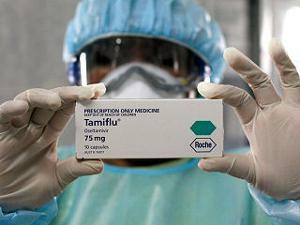 Trivalent inactivated influenza vaccine can be administered at any time relative to use of TAMIFLU. 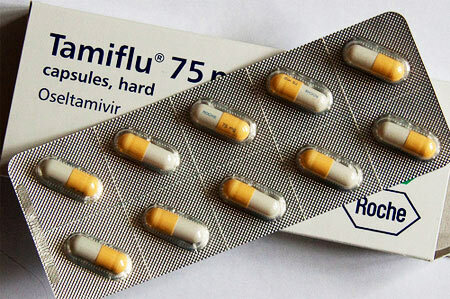 Tamiflu under examination – Side Effects: ‘Allergic reactions sometimes leading to shock, Asthma, Bronchitis, Chest infection, Conjunctivitis, Dermatitis, Diarrhoea, Difficulty sleeping, Dizziness, Ear infection, Ear problems, Erythema multiforme, Headache, Hepatitis, Indigestion, Liver problems, Lymphadenopathy, Nausea, Nose bleed, Rash or rashes, Runny nose, Sinusitis, Stevens Johnson syndrome, Urticaria, Vomiting. 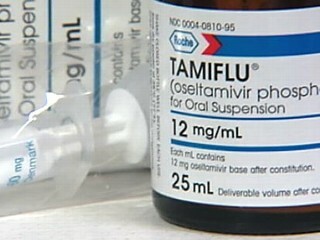 ‘The detection of an increased number of A(H1N1) viruses with resistance to oseltamivir (Tamiflu) was initially reported to WHO by Norway on 25 January 2008. The viruses carried a specific neuraminidase (NA) mutation (H274Y) that confers high-level resistance to oseltamivir in N1-containing influenza viruses. Prior to the recent report from Norway, such resistance was rarely observed in community isolates of influenza A or B. During the previous northern hemisphere winter season (2006/2007), surveillance through the Global Influenza Surveillance Network (GISN) laboratories found no oseltamivir-resistant H1N1 viruses among isolates from Japan or Europe, and less than 1% prevalence among H1N1 isolates from the United States of America. 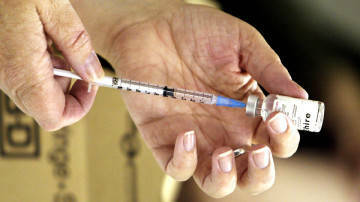 ‘Another round of fighting has erupted between British Columbia’s nurses and its health officer after a U.K.-based, non-profit scientific group publicly questioned the evidence used to justify a mandatory flu-shot policy for provincial health-care workers. Citing a letter in a Vancouver newspaper written by a doctor associated with group known as the Cochrane Collaboration, the BC Nurses’ Union announced Wednesday it has launched a formal grievance over the policy, while also demanding its immediate withdrawal. But Dr. Perry Kendall, B.C.’s health officer, said he thinks members of the public will be left scratching their heads over the science and called the nurses’ action “undermining.” This past August, Kendall announced the policy that requires health-care workers to get a flu shot or wear masks during the flu season. Union officials say those who are vaccinated are expected to wear a distinctive badge indicating they’ve had the shot. In the letter published in The Vancouver Sun, Dr. Tom Jefferson of the Cochrane Collaboration said Kendall misquoted a 2010 review conducted by his organization, when the health officer justified the vaccination of employees as a way to protect patients from the flu and pneumonia. Jefferson said the Cochrane Collaboration drew no such conclusion. “In other words, we report that no effect of the influenza vaccines was detectable on influenza and its complications such as death,” he wrote. He ended the letter with some strong words. “It is not my place to judge the policies underway in British Columbia, but coercion and forcing public ridicule on human beings (for example by forcing them to wear distinctive badges or clothing) is usually the practice of tyrants,” wrote Jefferson. The union seized on the opinion and said in a release it “shredded” the rationale behind the policy. McPherson said in a followup interview that her union has now corresponded with the CEO of Health Employers Association of BC and demanded it step back from the policy. “If the science isn’t there, how can the employer bring into place a coercive and punitive policy which has people wearing badges indicating whether or not they’ve been vaccinated for the flu,” she said. 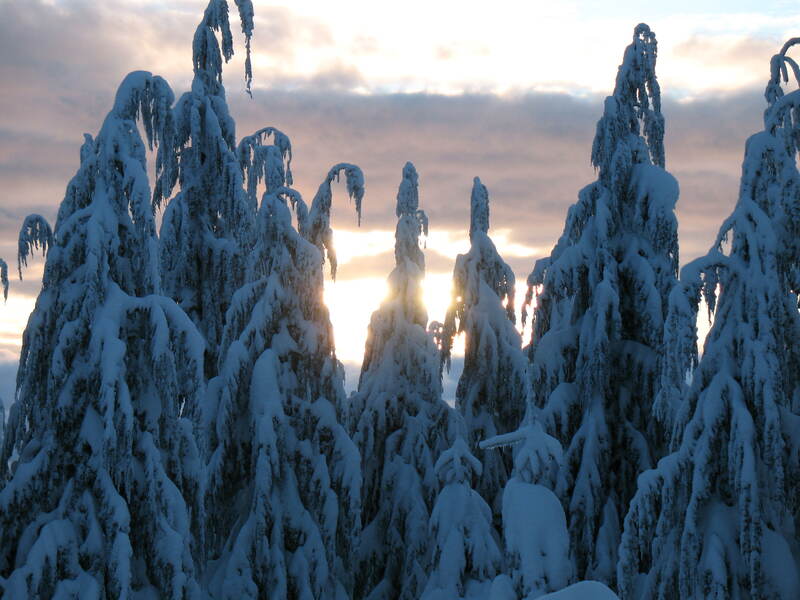 ‘The B.C. government has temporarily backed away from a controversial plan to force thousands of provincial health workers to get a flu shot before they can work with patients. Instead of forcing workers to wear a mask or have the mandatory flu vaccination, the B.C. Health Ministry said it will work towards compliance from workers in the first year of the program. In a letter dated Nov. 30 to B.C.’s health authority chief executive officers, deputy health minister Graham Whitmarsh said components of the influenza control policy would not be enforced for the first year. The policy remains in effect, but no disciplinary measures will be taken, a ministry official explained. “I would like to afford health care workers the additional opportunity to voice their opinions on how best to achieve our shared objective,” his letter said. The government launched the mandatory program to protect patients because it said a voluntary plan wasn’t working. Fewer than 50 per cent of workers were being vaccinated against the flu in some health settings. 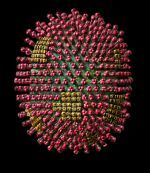 Vaccines for preventing influenza in healthy adults: ‘Influenza vaccines have a modest effect in reducing influenza symptoms and working days lost. There is no evidence that they affect complications, such as pneumonia, or transmission.This review includes 15 out of 36 trials funded by industry (four had no funding declaration). 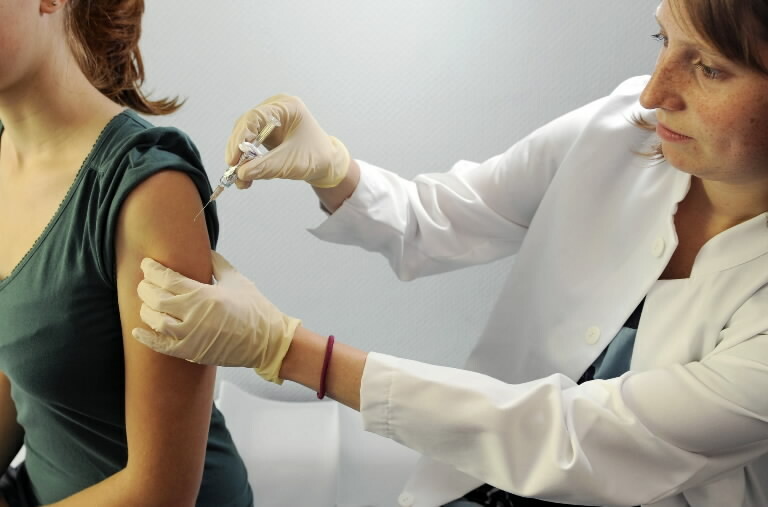 An earlier systematic review of 274 influenza vaccine studies published up to 2007 found industry funded studies were published in more prestigious journals and cited more than other studies independently from methodological quality and size. Studies funded from public sources were significantly less likely to report conclusions favorable to the vaccines. 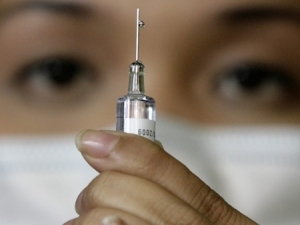 The review showed that reliable evidence on influenza vaccines is thin but there is evidence of widespread manipulation of conclusions and spurious notoriety of the studies. The content and conclusions of this review should be interpreted in light of this finding. The “clumps” which have been discovered floating around in the Influenza Vaccine Vial serum are a composite of insect variety Baculovirus protein vectors & seasonal Influenza virus-derived protein vectors, laced with detergents, formaldehyde, β-propiolactone, methylene blue, psoralen, carboxyfullerene (C60), binary ethylamine, acetyl ethyleneimine and/or treated with UV light or gamma irradiation. The Vaccine Resistance Movement recognizes the urgency of this matter, and will therefore be sending this unprecedented data, which exposes the methodology of systemic corruption rampant throughout the Vaccine Industry, to Government Health Departments around the world; in a concerted effort to warn the public, halt this wreckless method of production, begin immediate litigation proceedings against Novartis & further educate mainstream Medical practitioners on the front lines. 3. B/Brisbane/60/2008 – like strain (B/Brisbane/60/2008) 15 micrograms HA. Patent on use of Hemagglutinin protein vectors – ‘Influenza Vaccines Containing Hemagglutinin and Matrix Proteins: The invention does not use a whole virion (WV) antigen i.e. it does not encompass vaccines that use a live virus or a whole inactivated virion. Instead, the antigens of the invention are non-WV antigens, such as split virions, or purified surface antigens. Compositions of the invention comprise at least two influenza virus antigens: haemagglutinin and matrix. 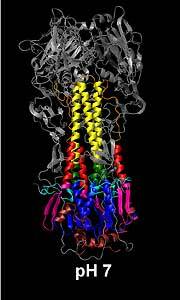 They may also include other influenza virus antigen(s), such as neuraminidase. 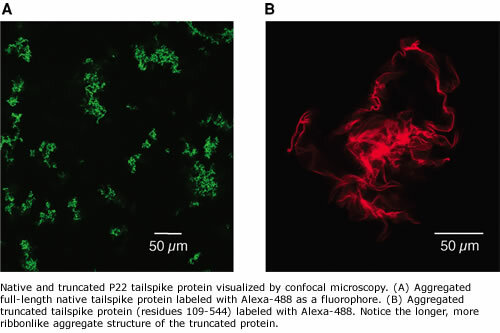 The antigens will typically be prepared from influenza virions (preferably grown in cell culture) but, in some embodiments, the antigens can be expressed in a recombinant host (e.g. in an insect cell line using a baculovirus vector) and used in purified form [3,4]. In general, however, antigens will be from virions. In preparing non-WV antigens from virions, virions may be inactivated. 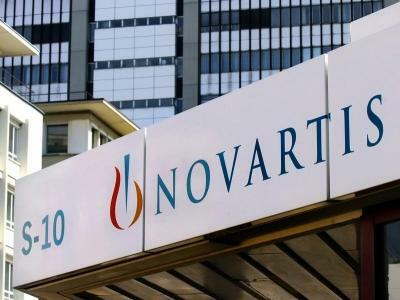 ‘France said it was halting sales of an influenza vaccine made by Swiss drugmaker Novartis as a precaution after potential impurities were found in batches of the product in Italy. Health Minister Marisol Touraine said on Friday she had asked for all doses of Agrippal to be withdrawn from the market. France said it had taken the action pending a decision by the European Medicines Agency (EMA), although the London-based agency said it was not taking a lead in investigations since the flu vaccine was authorized by national governments. 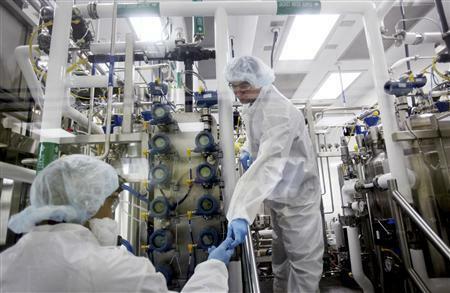 ‘Germany became the fourth country on Thursday to ban sales of flu vaccines made by Swiss pharmaceutical giant Novartis, following embargoes by Italy, Switzerland and Austria. 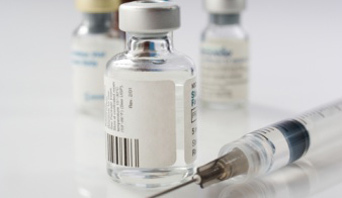 Announcing the latest ban, German health authorities said four batches of the Begripal flu vaccine — also marketed as Agrippal — and one batch of the Fluad vaccine were no longer for sale. “Novartis confirms its confidence in the safety and efficacy of its seasonal influenza vaccines,” the company said in a statement. ‘Canada is following the lead of several European countries and suspending distribution of flu vaccine made by the pharmaceutical firm Novartis. The decision relates to the discovery by the company of tiny clumps of virus particles in some batches of flu vaccines made at the Novartis production facility in Italy. Novartis has agreed to suspend distribution of its vaccines – sold in Canada as Fluad and Agriflu – while the department investigates the situation. The department is also telling doctors and others who administer flu shots in Canada to hold off using the Novartis product for the time being. “We think it’s prudent, given the response of certain European countries to … request of Novartis – and they will be complying – to stop distributing and then to recommend to practitioners to refrain from using the (Novartis) vaccine just until this review is completed,” Dr. Paul Gully, senior medical advisory for Health Canada, said Friday. 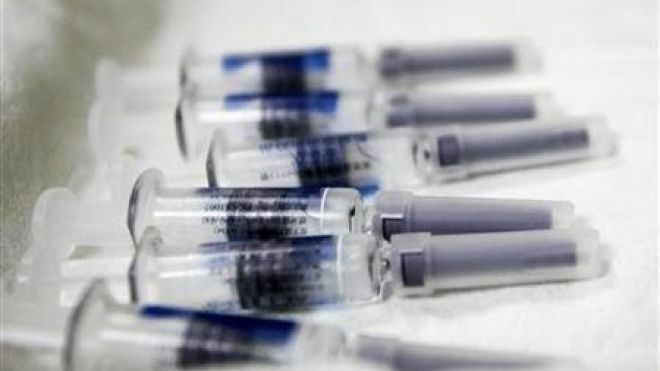 Italy, Germany and Switzerland have suspended distribution of some Novartis flu vaccine, and in the case of Germany recalled some lots of vaccine, after the clumping issue came to light. A statement from Novartis said finding minute clumps of virus protein in vaccines is not unusual. They said their vaccines passed quality inspections and so far this year there have been no signals of adverse events associated with use of the vaccine.